What is the hardest meal for you to get veggies in? I would bet you say breakfast! The nature of this meal in particular makes it more difficult than the rest to get those all important (and delicious) vegetables on your plate. What are some solutions? Blend veggies like greens into a smoothie. Grate carrots or zucchini into pancake batter, or even cook with your oats. Roast some tomatoes to enjoy with your eggs. Fill an omelet with different vegetables. Bake a bunch of veggies into a frittata. Top an egg sandwich or tacos with vegetables. 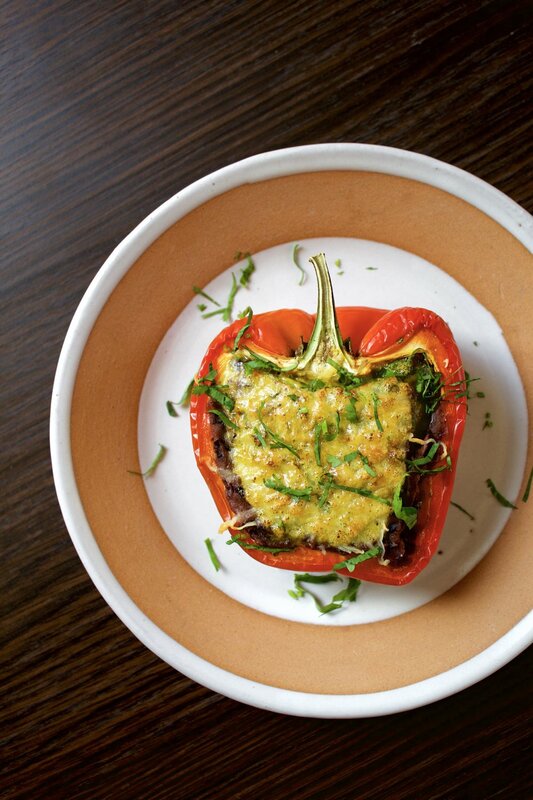 Orrrr make these super fun and delicious peppers stuffed with black beans and salsa spiced eggs! 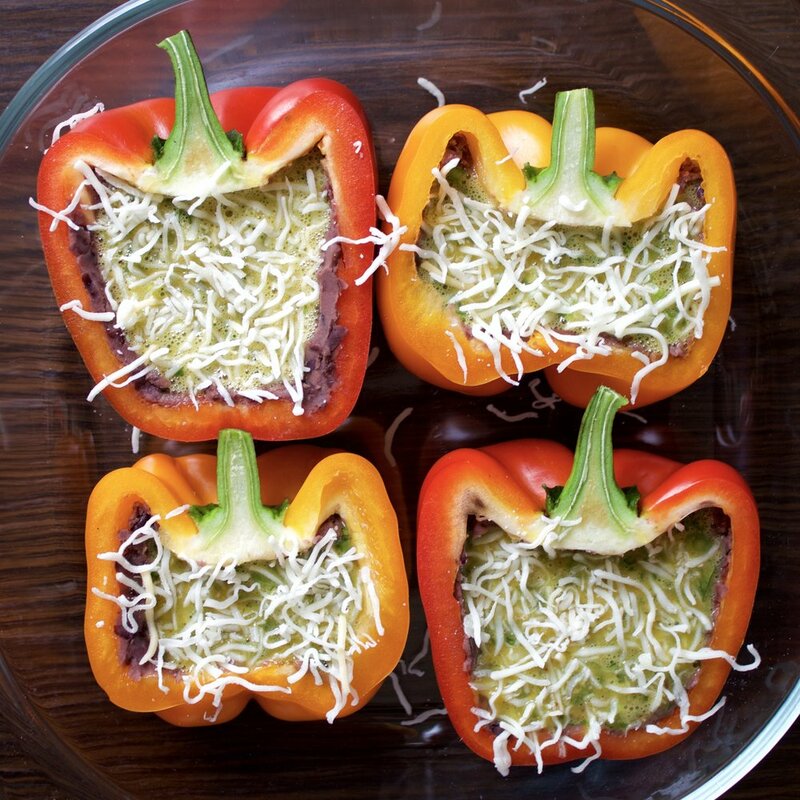 Not only do these peppers get you a whole veggie serving first thing in the morning, they are so delicious too! The sweet and savory roasted pepper shell perfectly complements the rich black bean layer that holds warm Mexican spiced, cheesy eggs in the center. These peppers on their own are also pretty nutritionally balanced. They have carbs for energy from the black beans, protein from the beans, eggs, and cheese, and fats from the egg yolks and cheese too. Although they make look a bit complicated, these guys are easy enough for really anyone to be a champ at. The hardest part by far is just waiting for them to cook. And they do take some time. Solution for busy mornings? Make a little batch of these the night before, chill them in the fridge, then just pop them in the microwave in the morning for a pretty awesome breakfast. Trust me, future you is going to be psyched! 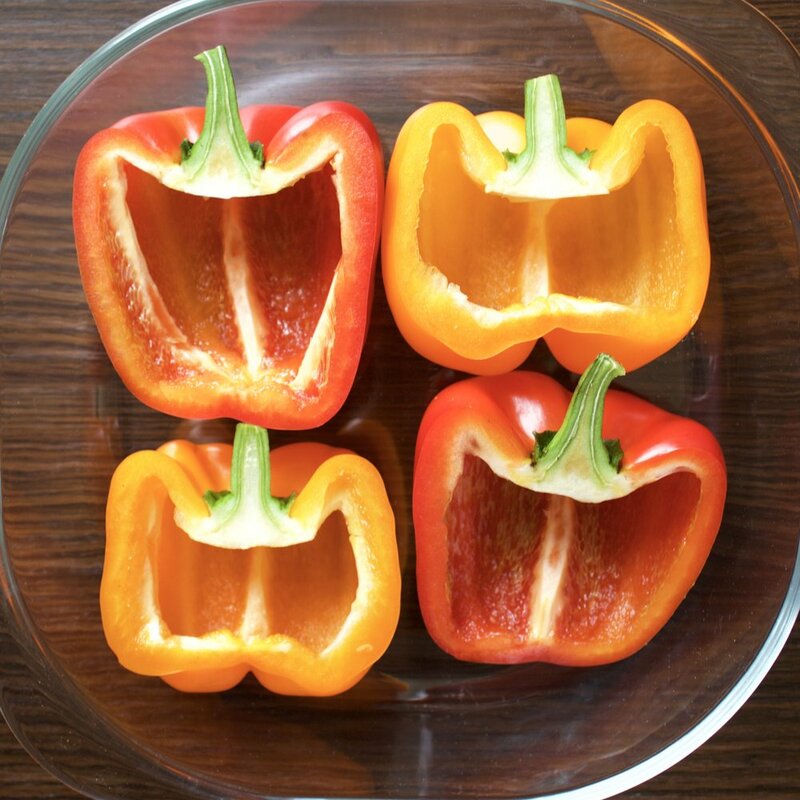 Cut peppers in half down through the stem. Remove seeds and white pith. 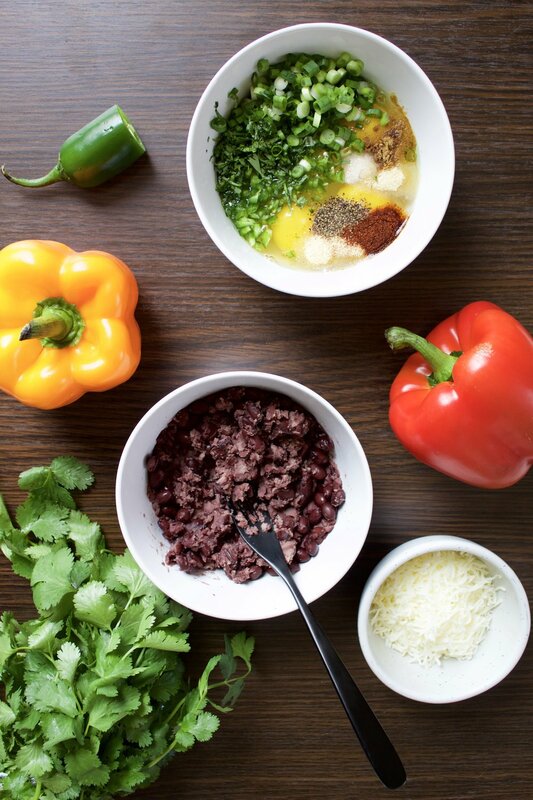 In a bowl, mash the black beans until almost smooth. Add the water and mix until evenly combined. In another bowl, whisk the eggs with the green onion, jalepeño, cilantro, salt, and all spices. Divide the bean mixture evenly into each of the 4 pepper halves. Use a spoon to firmly and evenly press the beans into the entire inside of the peppers. Grab a baking dish just large enough to hold the pepper halves. Try to wedge them in so that they are stable and not tipping at all. Pour the egg mixture carefully into the peppers, filling just about to the top of each. Sprinkle the cheese on top. Bake in the oven for about 1 hour. The peppers are done when the eggs are set and no longer jiggly. Remove from oven and enjoy right away, or cool down, store in fridge and reheat for a quick breakfast the next few days. Notes: Choose bell peppers that are pretty chubby-meaning they would fill well. It also helps to get ones with 4 ‘ribs’ or sections, as this can help them sit more stably in the baking dish if you cut down between the sections when prepping the peppers. This recipe is pretty mild in spice, so add more or less jalepeño and chipotle powder depending on your spice preference. Might I also suggest these for dinner...yum!